Membership of the DOG or confirmation of any oral presentation, video or poster does not include the registration for the meeting. All members of the DOG and all speakers are therefore requested to register prior to the conference. Online registration is preferable. Online registration will be confirmed automatically. If you wish to register by mail fax, the congress registration form can be downloaded here and should be sent to the congress office (PCO). 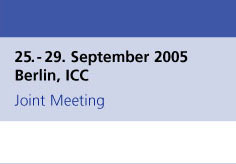 Only participants with an address in Germany who have registered and paid their registration fees by 15 August 2005 will receive their encoded name badge and voucher for congress documents if stated on the registration form or if stated in the online registration. A processing fee of  30 will be made for a second (lost or forgotten) name badge. Thereafter registration will only be possible on site. * Please note that payment has to be made by this date. ** A recent job certification is to be attached to the registration. Late submissions will not be accepted. *** Incl. one sightseeing tour, free entrance to the industrial exhibition, Opening Ceremony, Get-Together, participation in the official social programme to the special congress prices, one name badge, and a congress programme. **** Young EEC delegates who have submitted an abstract by 07 February 2005 pay 50% of the normal DOG residents fee if they register before 1 April 2005, irrespective of the acceptance of their abstract. Courses will be assigned in accordance with the valuation standards laid down by the Bundesärztekammer (BÄK). ** In association with the EUPO Course registration, participation on the congress is possible with a simultanous payment of the reduced fee for DOG Residents. Congress registration at a later date does not allow participation at a reduced fee. The registration fee for participants includes the congress programme as well as congress documents and free admission to all sessions of the scientific programme including CME accreditation for Germany and Europe. (The American CME accreditation is applied for. Delegates who are interested in the American CME accreditation have the possibility to apply for it on the registration form.) Furthermore, free entrance to the industrial and the poster exhibitions, and the Get-Together on Sunday will be inclusive. The registration fee does not include participation in courses and wet labs, separate registration is required. For participation in the official social programme, special tickets subsidized by the congress can be obtained. Guests interested in the industrial exhibition only are to pay a fee of  50 (per day) in order to obtain an official confirmation of attendance. Please note that any charges are to be paid by the sender. The fees for the social programme for accompanying persons are to be paid directly to Interklassik.